Jamie Oliver and Jimmy Doherty kick off the new year with their first ever all-vegan menu, joined in the cafe by the straight man of comedy, Romesh Ranganathan. Embracing the spirit of Veganuary, Jamie and Jimmy set out to prove that vegan food can be so delicious that you won't even miss the meat. 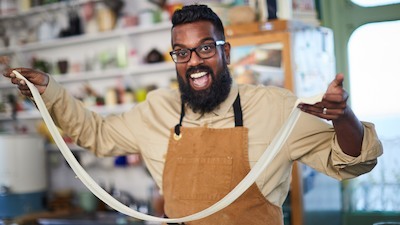 Romesh admits that the only thing he misses since he became vegan is a truly indulgent lasagne, complete with melting cheese and all the comforts of home, so Jamie takes up the challenge to reunite Romesh with his favourite dish. Jimmy's creative skills are put to good use when he builds a cold press to help a 16-year-old DIY enthusiast who wants to find a solution to fallen apples. And the boys visit the world's first fully vegan football stadium.